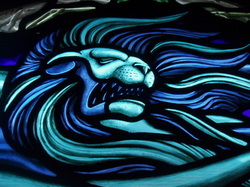 Aidan McRae Thomson has specalised in the design and execution of stained glass windows since graduating in 1996 and along with having spent time as part of a conservation studio has created windows for a variety of churches across the Midlands. He now works as an independent artist in the medium, and has recently added church mural decoration to his oeuvre. His biggest project to date has been the complete glazing scheme of eleven windows and painted ceiling decoration at the new St Anne's Roman Catholic church in Nuneaton.